Al at Hop Talk confesses that he’s really not much of a fan of fruit beers, and after trying six new ones, his opinion doesn’t change much. Also at Hop Talk, Ron compares a couple of blueberry beers, and tries to improve one of them by mixing it with Guinness. Andreea at Belgian Beers tries the “pink” and “girly” new Hoegaarden Rosée, a raspberry flavoured version of the classic Belgian witbier. Stan at Appellation Beer tries a fantastic sounding Raspberry Strong Ale from Berkshire Brewing in South Deerfield, MA, which is brewing using a whole whack of real raspberries. Ray at The Barley Blog is another fruit beer hater, so he dodges the bullet by reviewing Duchesse De Bourgogne, which isn’t a fruit beer at all but does have some fruit lambic character to the flavour. Plus it’s one of my favourite beers, so I guess I’ll let it slide. Rick at Lyke 2 Drink gives quick notes on 11 different fruit beers he’s tried in the last month, ranging from light wheat beers to some high-octane ales, and featuring flavours as varied as raspberry, blueberry, apple and pomegranate. Alan at A Good Beer Blog is pleased to find a fruit lambic that he likes in the form of Kriek De Ranke from Belgium. The Beer Nut in Dublin gets the award for tasting the most unique beers for this Session, as he tries examples flavoured with green tea and yuzu, palm nut, and banana. Steve at Summer of Beer is a relative newcomer to fruit beer, but he enjoys the pair of raspberry beers that he tries. Tim at Sioux Brew is new to the Session, and debuts with a look at Brau Brothers Strawberry Wheat. Wilson at Brewvana doesn’t really dig Longs Peak Raspberry Wheat, but is very happy with his homebrewed Cherry Bomb, a Belgian strong ale enhanced with bing cherries. He also offers a helpful list of beer styles that often have fruit-like characteristics without having any actual fruit added. Captain Hops at Beer Haiku Daily gives a couple of his patented 5-7-5 tributes to Lindemans Pêche and Dogfish Head Aprihop. Paul at Stuff. Y’know. is another Session newbie, and he tries two cherry beers: Bell’s Cherry Stout (which he doesn’t really like) and Unibroue Quelque Chose (which he does). Craig at Beers, Beers, Beers reviews three beers in three different flavours – apple, cherry and peach – and ends up liking them all. Another Session newcomer is The Dude at Akelas Biggins, who gets nostalgic with a look back at the original Austin-brewed version of Celis Raspberry. Jay at Brookston Beer Bulletin checks in with one of his typically informative and interesting posts where he lists dozens of different fruit beers grouped by fruit, and then reviews what is probably the first ever beer brewed with plumcots, a plum/apricot hybrid that’s one of my favourite fruits. Paul at Beer & Food is a Session virgin, so it’s fitting that his post is entitled “My First Cherry”. 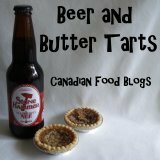 Stephen does double duty once again, with reviews of Bell’s Cherry Stout at On The House and Wild Rose Wraspberry Wheat (plus mentions of a few other Canadian fruit beers) at Stephen Beaumont’s Beer Blog. Sage at My Beer Pix does a bit of self-analysis regarding what he likes and doesn’t like about fruit beers in general, rather than reviewing one in particular. And he also has a very funny picture of a banana in a glass of beer. Ted at Barley Vine is pretty happy with his choice of Atlantic Brewing’s Bar Harbor Blueberry Ale. Jon at The Brew Site doesn’t have any fruit beer on hand, so he decides to “wax rhapsodic about fruit beers in general”, and also links back to reviews of some fruit beers he’s posted about in the past. Andrew at Flossmoor Beer Blog offers his personal opinions, and those of some other people, on two fruit beers (or more accurately, two different versions of the same fruit beer) that he brews for Flossmoor Station. OK, I lied when I said that The Beer Nut tried the most unique beers, as the award really must go to Chris at Beer Activist, who brewed up a batch of mfula mfula (aka riva riva), an African fermented drink made with bread, oats, sugar and pineapple. Jesse at Twin Cities Beer Geek takes one for the team and reviews Miller Chill. Jack at The Beer Tap missed last month’s session, but he returns this month with a mixed trio of peach, raspberry and blackberry beers. Bill at Beerjanglin’ is yet another Session newbie, and he arrives in fine form with a witty and well-written feature on three East Coast offerings. Dave at Hair of the Dog Dave pays tribute to my Canadian-ness by writing up two fruit beers he tried on a recent visit to Vancouver. Adam at Beer Bits 2 (does that mean there’s a Beer Bits 1 somewhere?) looks at two raspberry beers that are quite different from each other despite featuring the same fruit. maeib at maeib’s Beerblog looks back at some of the many fruit beers he has known. Spence at Brewer Man reviews Dogfish Head Black and Blue – a beer that I sincerely wish was available in Ontario, as it sounds fantastic – and also gives his thoughts on a few other fruit beers that have impressed him. Londoners Boak & Bailey review a couple of blackberry beers – including one they brewed themselves – as well as beer brewed with tayberries (yeah, I’d never heard of them either – they’re a cross between raspberries and blackberries). Lost Abbey’s Tomme Arthur is late with his post at Brewer’s Log (Blog), but since it’s a really fascinating look at his own Cuvee de Tomme, we’ll let it slide. And finally, some guy named Greg at Beer, Beats & Bites is pissed that the beer he wanted to review didn’t show up, but stumbles across three others unexpectedly, so it all works out in the end. So, I think that went pretty well, don’t you? I figured that my theme choice would be a controversial one, and based on the number of people who started their post with “I normally hate fruit beers…”, I guess I was right. To be honest, though, I think the reason why fruit beers get such a bad rap from a lot of beer geeks is because they instantly think of the ones that are most common in North America – i.e. filtered wheat beers or other light ales and lagers that are flavoured with cloyingly sweet and often artificial tasting fruit extracts. The fact that such beers made up a large percentage of those covered in this Session goes to show just how ubiquitous those type of fruit beers are. But thankfully, a number of people looked at some more classic and/or bizarre examples as well. (There is an) amazing diversity of different fruits used in beers. No two are alike, and so saying you don’t like fruit beer is like saying you don’t like people. There’s just too many variables to make such a blanket statement. I think it comes down to perception again of some weird prejudice in the U.S. where fruit in beer is seen as unmanly, as ridiculous a notion as I can imagine. There’s just too many good flavors here to ignore them over masculinity. But I guess that’s more for the rest of us. This entry was posted in beer reviews, The Session. Bookmark the permalink. Wow! Lots of good stuff there. I’ll be reading for a while. I’m very glad to see so many Session newcomers. Welcome to you all! Thanks again for hosting :-) Great wrap up! Re: Beer Bits 2 comment. Yes sir, there was a Beer Bits (one). It became The Brew Lounge. Wow, if my quick count is correct that was 33 beer bloggers at The Session #6! Thanks for hosting. That’s a big target to shoot at for Session #7, which Lyke2Drink will be hosting. Watch for the topic to be announced soon. Thanks for hosting – seems to be a completely different fruit beer scene in the US (we tend to have Belgian stuff or nothing). Hope some of it is at the Great British Beer Festival! Damn You, Chris at Beer Activist! After reading his entry I couldn’t help but open up a bottle of the most recent batch of Cuvee De Tomee. So good, so verry verry good. rudy – Tomme was late getting his post up and letting me know about it. I’ve got it listed now. All others – you’re welcome, and thanks back at you for all the great posts. Onward and upward!